Say the name Catch The Fire Church to any middle-aged or elderly Christian in Britain and you probably won't get a flicker of recognition. Even if you try that Church's earlier names, Toronto Airport Vineyard or the Toronto Airport Christian Fellowship, you're still unlikely to get anything other than a puzzled "who?". But if you use the phrase "Toronto Blessing" you will, almost certainly, get an immediate response; sometimes a very affirmative one which might well lead into personal accounts of an extraordinary moment in world Church history, but sometimes a very negative one with words like "unbiblical" and "heresy" thrown around like the evangelical equivalent of the f-bomb. The Toronto Blessing was a term coined by British newspapers to describe a Christian revival which began in January 1994 at a Canadian church, Toronto Airport Vineyard (TAV), which was renamed in 1996 to the Toronto Airport Christian Fellowship. It was a movement of God which didn't stay in the confines of TAV but spread to numerous churches and thousands of individuals across the UK and other countries in Europe. The manifestations eagerly picked up by the British press included numerous supernatural healings of various injuries, large numbers of worshippers falling down under the power of the Holy Spirit and even claims of God putting gold fillings into people's teeth during the service. The two manifestations, however, which the tabloid media were keen to report on were the bizarre animal noises that some people manifested, including the roaring of lions, and a substantial amount of Holy Spirit laughter where, sometimes, entire congregations would be caught up in sustained laughing fits, one or two lasting for more than a day. During the height of the Blessing, TAV, presided over by pastors John and Carol Arnott, had to run evening meetings six out of every seven days to accommodate the thousands of visitors who flocked to the church to see for themselves what was going on. In December 1995, Cross Rhythms visited TAV and reported on some of the extraordinary things it saw happen there. During its days at the church, CR interviewed TAV's main worship leader, Jeremy Sinnott. He said at the close of his interview, "I think at the moment what God is doing is reviving his Church so that the Church really falls in love with him. We are so cerebral, so many of us have a head knowledge of who the Lord is or what he is about but as far as our heart knowledge, our compassion, we hardly have any. The renewal is changing this. When this happens that's a much better environment for revival to happen. . ."
The month that Cross Rhythms visited Toronto Airport Vineyard, the church was released from affiliation with the stream of Vineyard churches which had begun with American preacher, revivalist and occasional musician John Wimber. The reasons for the disaffiliation were for growing tension over the church's emphasis on extraordinary manifestations of the Holy Spirit, the methods used to logistically manage the ministry time during the services, a concern about leaders not abiding by established Association of Vineyard Churches guidelines and the Vineyard leadership's inability to exercise oversight over the revival. As the years went on, several church leaders who attended meetings in Toronto were impacted by what they found there and took the principle of an abandonment to the Holy Spirit back to their churches and mission fields. Heidi Baker, after attending the meetings in Toronto, went back to Mozambique and in the years since, along with her husband, Rolland Baker, has planted more than 10,000 churches throughout Africa and Asia. Their organisation, Iris Global, also provides food for 10,000 children each day, operates three primary schools and five Bible schools; all of this success is attributed to what started in Toronto. Nicky Gumbel, the curate of London's Church of England, Holy Trinity Brompton at the time of the Toronto Blessing and the founder of the spectacularly successful Alpha course, has been quoted as saying that the Toronto Blessing was "the kick start that the Alpha course needed." One year after a pastor in Weaverville, California, Bill Johnson, visited TAV, he took over as senior pastor at Bethel Church in Redding, California which has become known as a place of supernatural healing, impartation and ministry training as a result of what occurred in Toronto. Several of the current team of musicians in the Bethel Music band of revivalists acknowledge the part Toronto Airport Vineyard had to play in helping lay down the principles of Holy Spirit impartation. For a number of years, even after its name change to Toronto Airport Christian Fellowship, TAV continued to play a major part in both influencing church movements and, among other things, helping to creatively develop the modern worship movement. Such albums as 'Catch The Fire' (1995) through to 'Catch The Fire: Mercy Over Me' (2004) demonstrated that worship music still had an important part to play in the church's activities. By the mid-'00s, the massive flow of visitors to TACF had diminished to a trickle, but the church itself continued to flourish and although some of the supernatural manifestations ceased it continued to thrive. In 2013, the church changed its name to Catch The Fire Toronto and was even able to plant other fellowships around the world. There are currently now Catch The Fire churches in London, Manchester and Bournemouth and in such other places as the USA, South America, Scandinavia and Australia. Catch The Fire Toronto's current pastors are Steve and Sandra Long, who originally served during those halcyon days in 1994. Speaking in an interview with Alice Clarke on the Catch The Fire website, Steve spoke to the mass of young people who are too young to have experienced the Church history-changing events in Toronto in 1994. He said, "Here's the good news: Revival isn't just a one-time event. You may not have been there in Toronto in '94 or '95, but don't worry about it. Revival is not just what happened, it's what's continuing to happen." In January, Catch The Fire Toronto celebrated 25 Years Of Revival. Tied into that celebration is the release of the album 'Presence: Live From Toronto', an album with global distribution from The Fuel Music. Recorded live at Catch The Fire Toronto and featuring worship leaders from around the world, this full-length album highlights 10 songs that capture the raw, spontaneous, unfiltered worship of the Catch The Fire movement. Produced by Matt Fish and mastered by Drew Lavyne (Michael W Smith, Jesus Culture), 'Presence: Live From Toronto' includes songs written and led by Chris and Summer Shealy, Jonathan and Alice Clarke, Grammy Award-winning songwriter Amber Brooks, and Steve Tebb. 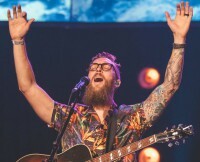 These worship leaders deliver songs written by Britain's Martin Smith and America's Israel Houghton along with four spontaneous, authentic expressions of worship recorded live for the new album. Said songwriter Chris Shealy, "This project captures the fiery essence of who we are as a worship movement and the cry of our hearts to encounter God's transforming presence. We are a family of worshippers from around the world, brought together by a passion for God's presence. Encountering God is at the heart of what we do. Every time we gather to worship, we want to see hearts set on fire with love for Jesus, sons and daughters discovering true freedom and God moving among us just as he wants to."